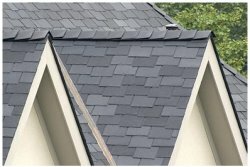 The Ebricks.com Tile Roofing guide offers information about companies such as Sheldon Slate Products Co., Inc. and Tile Roofs, Inc..
Family-owned company with quarries in Maine and New York manufactures slate products including floor tile, countertops, sinks and roofing. Company supplies and installs historical and salvaged vintage clay roofing tiles. Importer of clay roofing tile from Greece. Clay roofing tiles in a variety of styles, colors, and finishes are the speciality of this long-time manufacturer. California company has been making glazed and unglazed ceramic roof tiles for a century. Products are Energy Star complaint. Camara quarries Vermont slate for roofing, floor tiles, countertops and flagstone. It also sells used slate. This company bills itself as the Midwest�s leading specialist in basement waterproofing and structural foundation repair, with over 250,000 dry basements over the past 50 years. Since 1853 and through five generations, this family of toolmakers has manufactured specialty tools from the same Philadelphia factory. Specialties include slate hammers, rippers and cutters; brick hammers and cutters; tile cutters; roofers' adzes; and tinners' hammers. Leading manufacturer and distributor of pro-quality hand tools. The company sells tools for masonry, concrete, plaster, tile setting, roofing and flooring, as well as such items as tool bags and pouches, scaffolding, transits and levels and much more. 10-inch tiles add another dimension to EcoStar's steep-roof product line. 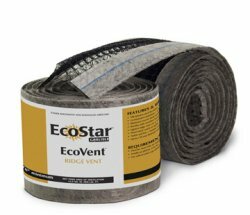 Rolled ridge vent is easier to install, less visible.